So the 2nd quilt of my three mini quilts that I’ve been working on this past week is one quilt in a set of 2. I took a motif that I loved in a fabric that I really didn’t own a ton of. I cut up the large portion of the motif and made a mini quilt out of it. Then I framed the quilt. I used little borders of coordinating fabrics that I thought I would like in a polka-dot apron. You can tell these fabrics are part of a set. 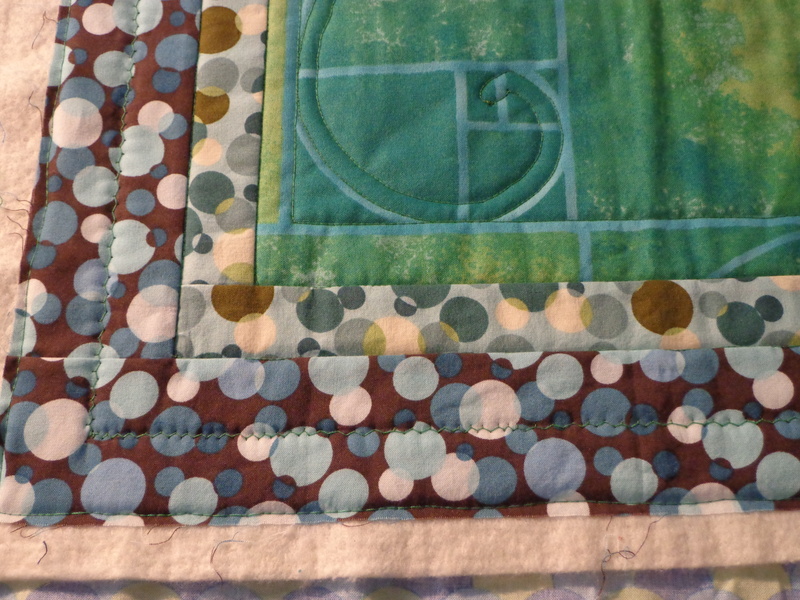 Currently you can see the fold line on the quilt, there is so little quilting on the quilt. 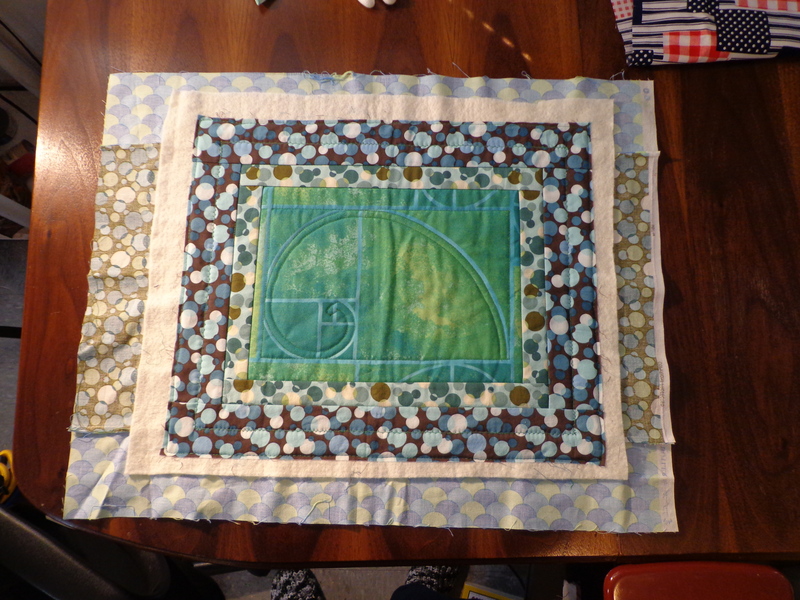 Hopefully for this quilt, the minimal style quilting will win out in the end. The next one, quite similar, is much more heavily quilted. Here’s a close up of the curve. This is obviously a quilt where the design influenced the quilting style. I could make one more spiral a little ways out from the fibonacci curve, but I want this to be simple, simple. So I decided to do one quick little decorative stitch, all while I had my quilting foot on the machine. Key is to go steady and you’ll be fine. This quilt taught me to “hold back” and “go steady. And that you can still quilt decorative stitches with the darning foot. And it’s simple and I just like it. Which is all a quilt ever really needs to be. Something somebody liked at one time! Currently the fabric you see on the back, an olive green with the same dot family, is on tap to be the binding on this quilt. I am joining the binding straight edge, so I’ll see what that process is like since I’m really not all “that experienced” on binding. And I am considering doing a blog post and/or podcast on TaDa Triangles and kicker bindings since people have been curious about both of those items based off my last podcast. 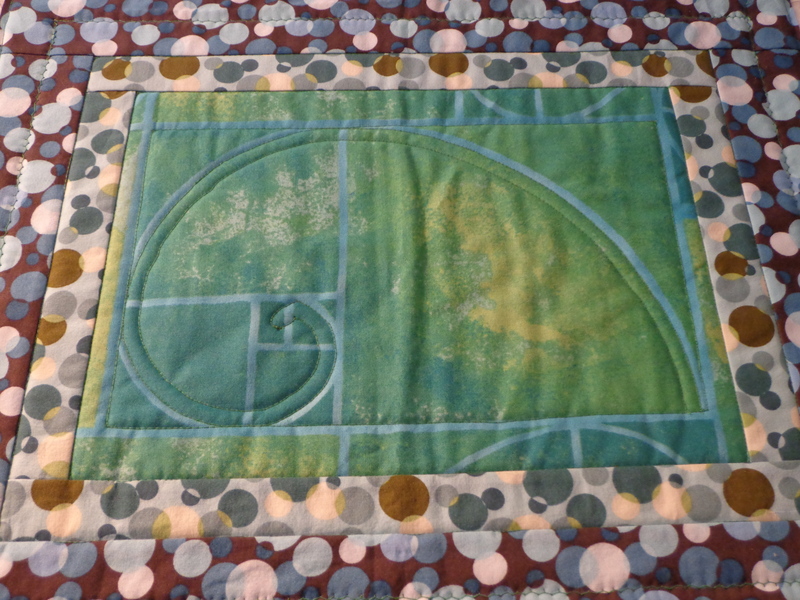 But before that, the more heavily quilted partner to this quilt, the Feather Fibonacci (to be shown at a later date).